For me, bow hunting is about the excitement of close encounters and calling big game in. Sometimes it’s so close as to be intimidating. This season we were “chasing bugles” in an area where we have done well in the past. We were headed up the hill and hoping for another bugle so we could zero in on the bull’s location, when a large animal shifted its weight within 40 yards of us. ELK! My hunting partner, Steve, immediately signaled that he would drop back and call. Within a minute Steve had worked back down the hill. He started cow calling and breaking branches. The animal broke one branch and then everything was quiet. We had been working our way up an old road and I noticed that I was set up at the intersection with an even older road. The older road was all the way brushed in except for one game trail. Wouldn’t it be just like an elk to sneak down the trail right behind me, I reasoned. I shifted my footing ever so slightly to cover both shooting lanes. Everything was quiet for a minute or two and I strained to hear any movement in the thick cover. Glancing back at the trail I was shocked to see movement up close. I did a double take at the same time as the bear did. He stood ten feet away from me, and our eyes locked for a moment. The bear turned and ambled back up the trail. I cow called and drew my bow, the bear, possibly confused, stopped at twenty yards, quartering away. With the perfect shot angle, I settled my sight pin behind the front shoulder and hesitated for a moment, just long enough to evaluate the bear. It was a small black bear so I decided to pass, but focused on my sight pin. I had this one dead to rights and let it walk away. Truth is, if he would have been bigger that initial contact at three yards might have really shaken me up! 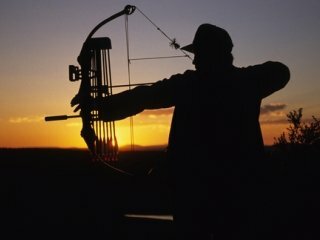 This is bow hunting to me, life at full draw. Up close and personal with the wilderness, as close as you can be to part of the wilderness with power bars and water bottles.